Many processes such as conformal coating and Wave soldering demand protections and masking of PCB and components. Our masking solutions available in both standard dots & tapes and can be tailor-made for any masking needs for auto apply and manual applications. The labels and tapes can be removed safely without leaving any residues. Polyimides – The material shows excellent electrical properties and resistance to high temperature as well as endurance to cold temperatures. Also available in an ESD safe version. 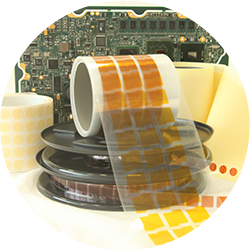 Polyester – Coated with a thermosetting rubber adhesive, the labels or tapes is highly conformable to the PCB tracks. High temperature paper –Suitable for wave soldering and conformal coating masking. Available as a tape, as a cut label or as stripes. Conformal Coating Masking Label Set – Custom designed masking labels set matching the shape, size and relative position that need to be masked on the PCB. It is offered with various masking materials upon demand. Silicone Caps –Conformal coating masking silicone caps for masking components/connectors. The caps are flexible, reusable and adjust their shape to the component or connector it is attached to.